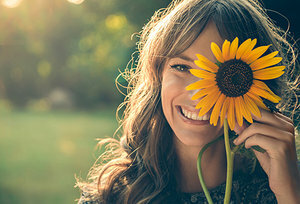 Get some sun on your face: For most of us, winter means significantly more time indoors, avoiding the bitter cold and harsh weather winter generally brings. From a health perspective, that can mean less physical activity, more stress (from not enjoying the beauty of the outdoors) and, because of low exposure to sunlight, lower levels of vitamin D. With spring underway, now's the time to change all that. Hit the great outdoors as often as you can and soak up a little sunlight (10-15 minutes a day will ensure vitamin D intake without burning the skin). Before you know it, you'll be a new person, physically and mentally. Stick to your sleep: There's actually a drawback to spring, namely longer days and shorter nights. Coupled with Daylight Savings Time, we have ample time to fill our days with activities that tire us out - and give us little time to refresh and regenerate. That's where the power of sleep is absolutely crucial. The solution? Commit to regular sleep and wake times, and prepare appropriately for restful sleep so once you're out, you stay out until morning comes. After all, you can't enjoy spring if you're tired and grumpy every day. Review your plan ... or make a new one: We're in Q2 – the second quarter of the year in business strategy terms. How did Q1 (January-March) work out for you? Have you stuck with your New Year's resolutions? Is it time to add to the list? You don't have to wait until 2020. If your exercise schedule hasn't been consistent, dedicate yourself to a more active, productive spring at the gym. You definitely have more opportunities as temperatures rise and the weather becomes more favorable. If you need to lose weight (but have struggled to do so), spring is a time of rebirth, new growth – and when it comes to your health, a new chance to take control. Springing into health this spring means doing more of what makes you healthy and less of what's kept you in the proverbial dark all winter. Talk to your doctor for more easy ways to advance your health and wellness lifestyle this spring and all year round.